Winter is here and it’s not looking like it will be leaving the St. Paul, MN area any time soon. Although a winter wonderland is beautiful to the eyes, it can cause significant damage to your home. 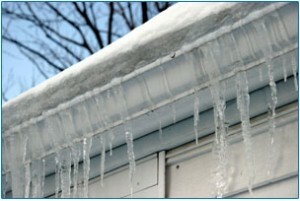 Too many times, our team at Minnesota Leafless Gutters has seen ice dam buildup occur. Dealing with ice and snow buildup is not an easy task and should only be handled by professionals. The risk of injuring yourself on a slick roof is simply not worth trying to save a few bucks. Instead, let our licensed and insured staff handle all of your ice dam removal needs. If you are new to St. Paul, MN, the term “ice dam” may not be something that you are familiar with. Simply put, an ice dam can develop when snow accumulates, heat causes the snow to melt and then cold temperatures cause that melted snow to refreeze. It doesn’t take much snow accumulation for an ice dam to occur, so it is important to keep any eye out for these ice dams. With the regular snow and cold temperatures that St. Paul experiences, ice dams are a serious threat to the health of roofs in this region. The worst thing that can happen is for these ice dams to increase in size as the melted snow can eventually push its way under the roof shingles and into your home! It is never a good idea to ignore signs that your roof may be in danger. If you continue to let ice dams build up, more pressure and weight will be added to your roof. Shoveling snow and chipping ice away from the edge of your roof is not the solution. Let our dedicated staff use our high quality steam machine to safely remove your ice dam. Through this steam machine method, both your roof and family remains safe. At Minnesota Leafless Gutters, more than 17 years of experience dealing with ice dam removal has helped us master the process. By developing a partnership with our staff, you create a relationship with our owner, Tim. Keeping your home and roof protected from ice dams is Tim and our entire staffs top priority. As mother nature continues to lay inches of snow and thumps St. Paul, MN with frigid temperatures, do not ignore any ice dams that develop on your roof. Let the ice dam removal experts at Minnesota Leafless Gutters handle this dangerous task so that you and your home remain safe. To learn more about our services or to request a free ice dam removal estimate, give us a call today at (612) 221-0362 or email mnleaflessgutters@gmail.com. Spring Lake Park, St. Louis Park, St. Paul, West St. Paul, Stillwater, Sunfish Lake, Vadnias Hights, Wayzata, and Woodbury.